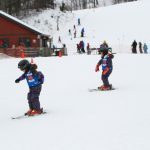 The main reason we returned to Mount Snow this year was for their ski school. We were so impressed with the ski school last time. The first time we went there, it was Maggie and Alex’s first time on skis and the teachers were wonderful with them and they loved it. 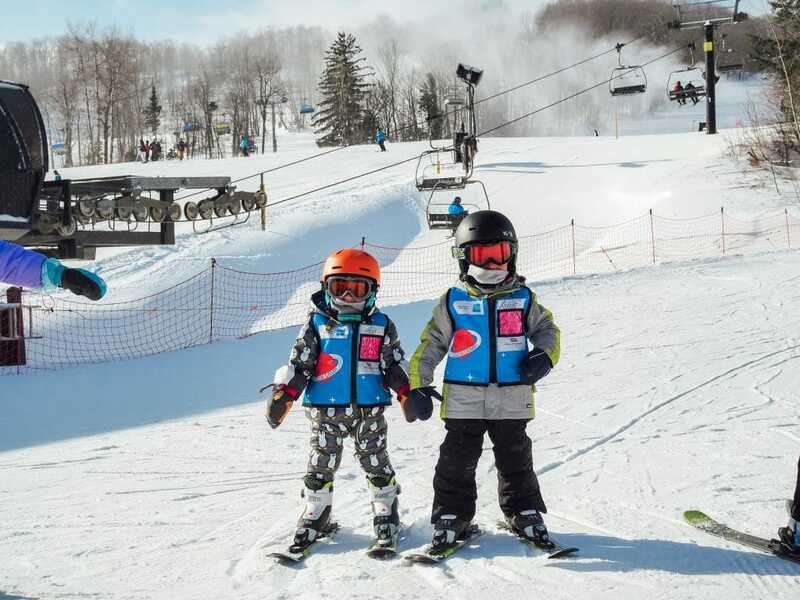 This winter we wanted Tommy and Miles to try skiing and knew we’d feel comfortable putting them in the ski school at Mount Snow. Once again, we were blown away with how amazing the instruction was and how much all of our kids loved their time in ski school. The girls progressed so much in one full day of ski school. They were in the Mountain Camp full day program. At the end of the day, the instructor gave us some tips for taking them up the chair lift to ski with Dad the following day. She said they were ready – and they sure were! 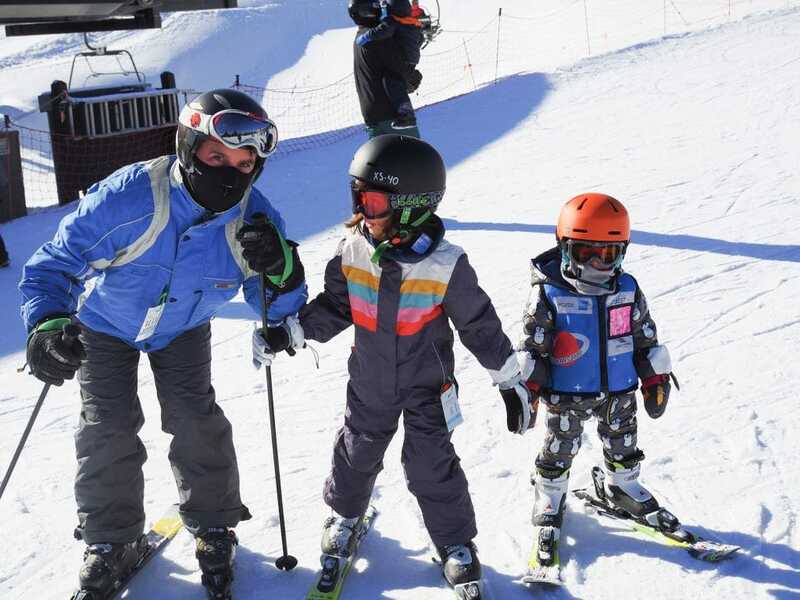 Thanks to a day in Mountain Camp, they had a fabulous Saturday skiing with Dad. The boys did the half day Cub Camp. The Cub Camp instructors have incredible patience. They take care of getting the little ones their rentals, they help you get them all ready in their boots, etc and miraculously get a group of tiny skiers out to the mountain. 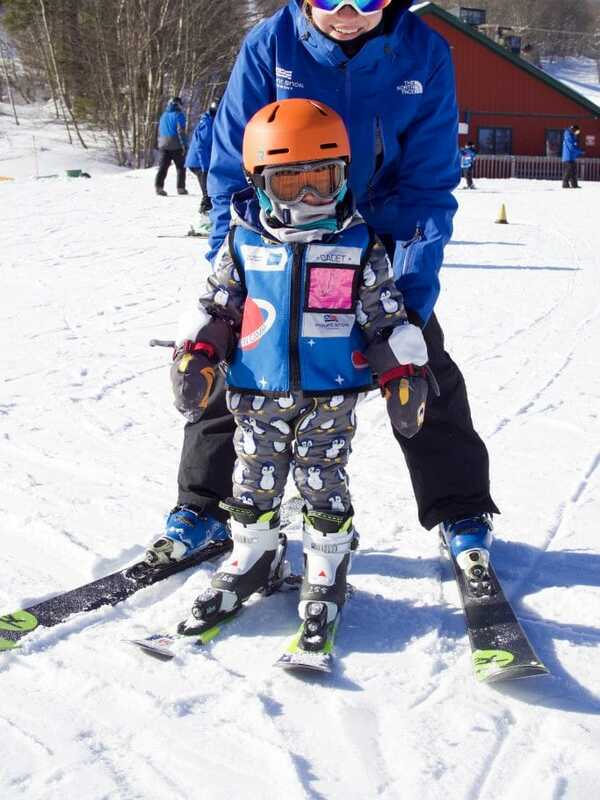 When I first peaked in on the Cub Camp, Miles was hysterically crying (he doesn’t always like when I leave him) and soon after, he was smiling and skiing down the hill. Tommy loved it from the first minute and I was so impressed that he was skiing on his own so soon after camp started and even having the control to ski around cones, etc. 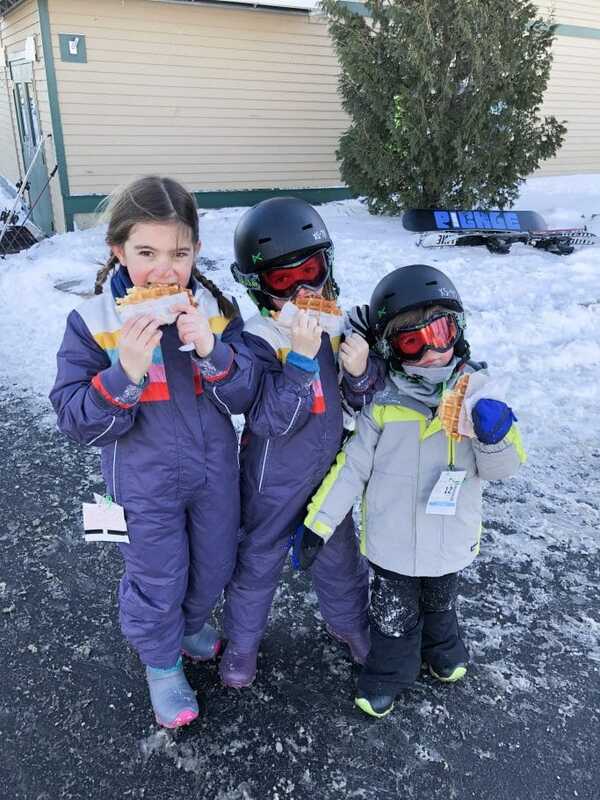 I am so happy we chose Mount Snow for the boys first skiing experience, because like their sisters’ first ski experience (on the same mountain!) years ago: it was a huge success and lots of fun. 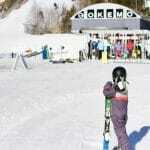 The Grand Summit Resort is located right on the mountain at Mount Snow. We chose to return to this spot because it’s honestly so convenient with little kids. 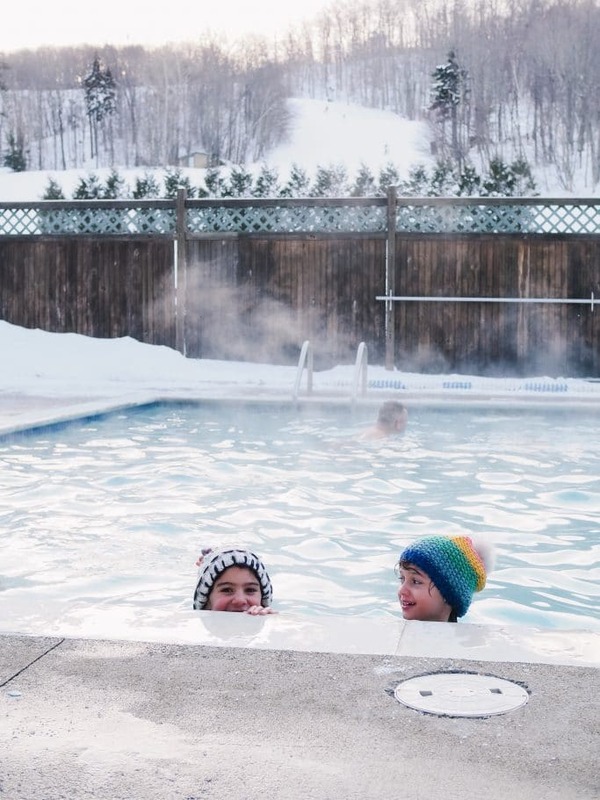 Everything you need is right in the hotel, when it’s time to ski, you walk right onto the mountain and there are tons of activities for families when you’re not on the slopes. They have a number of rooms that fit families. Typically we don’t fit easily in a hotel room with 6 but our room at the Grand Summit had a bedroom (where we had a bed & a crib), a living room with a pull out and a loft with another bed. There was plenty of room. Major bonus: a kitchen and a ton of closet space for ski gear. The indoor/outdoor pool is so cool! After a day out in the snow I enjoyed relaxing in the hot tub while the girls enjoyed the pool. It’s so neat to be outside in a pool while surrounded in snowy mountains. Besides our drive over to visit the Carinthia Base Lodge, we didn’t move our car the whole long weekend. There are spots to eat inside The Grand Summit and you are also so close to the mountain, that you can walk over there to eat as well. Last but not least, we love The Grand Summit for the family activities. After a long day skiing, we really don’t feel like leaving the hotel. The hotel has the cutest activities for kids and they’re all included in the stay. 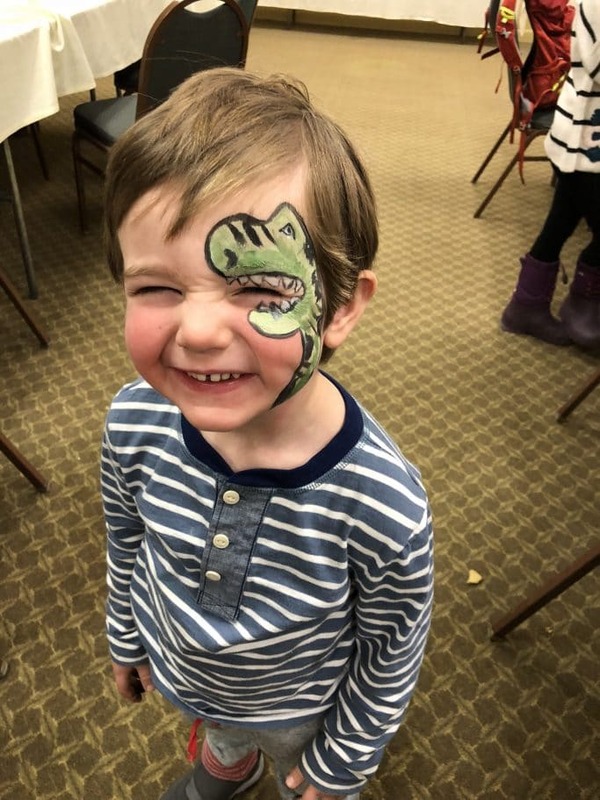 Our kids did face painting and coloring and one night when the boys went to sleep, the girls and I went down for the family movie where they set up a movie theater screen in one of the ballrooms and had the movie Smallfoot and popcorn. It’s really a nice perk for families. One of my favorite parts of the weekend: snow tubing as a family! It seems like we’ve had a baby in tow forever (probably since we have ha!). So this was a pretty big deal for us. We had tried snow tubing at Mount Snow during the last trip so I knew it was well run, safe and something I thought the boys could try. We figured we’d give it one run and see what the little guys thought (we knew the girls would love it). Well, one run lead to a whole morning of fun! All 6 of us had a blast. 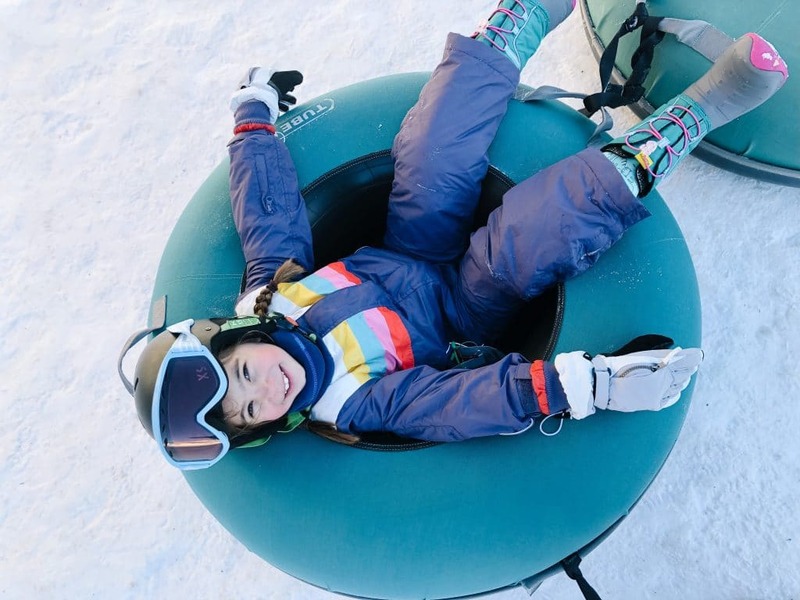 The snow tubing at Mount Snow is top notch. One thing we love about visiting Mount Snow: the distance. It takes about 3.5 hours from our house which is perfect for a weekend getaway. 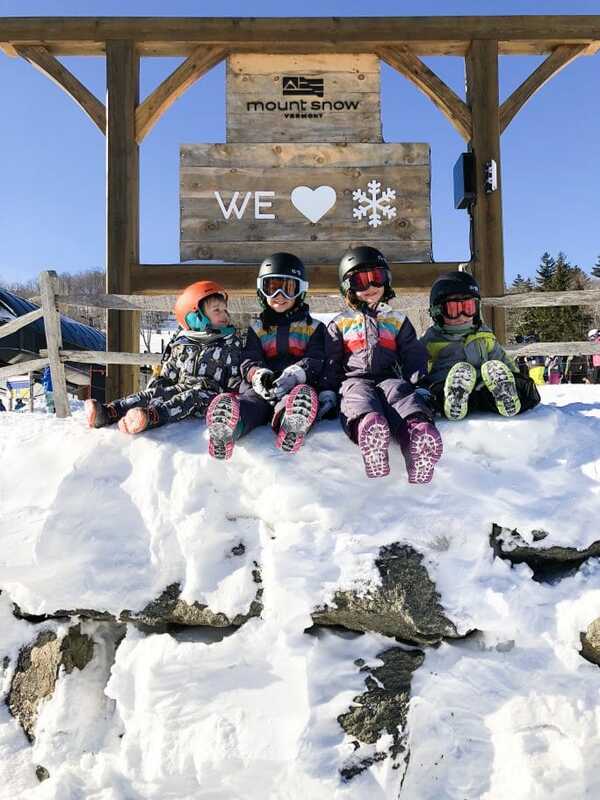 If you are in the New York, New Jersey, Connecticut, Massachusetts area, Mount Snow is super convenient. Mount Snow is “Vermont’s closest big mountain”. As far as timing, we like to drive up Thursday night after work/school and enjoy the mountain when it’s quiet on Friday. Then ski again Saturday, snow tubing Sunday AM and then hit the road. 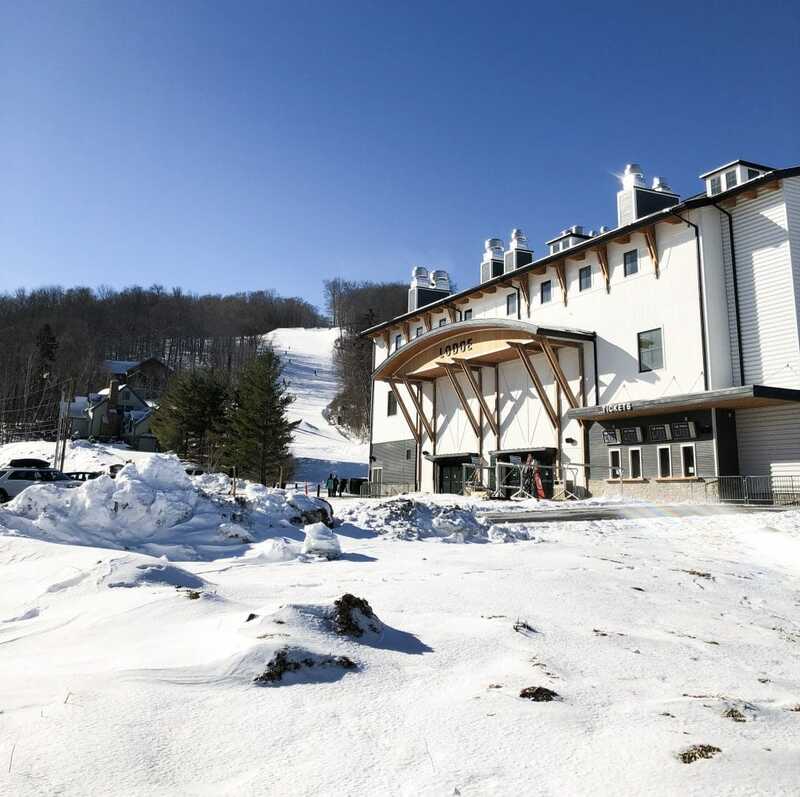 Since we last visited Mount Snow, they opened a new base lodge: Carinthia and their brand new Carinthia Parks. I had read about the new addition and couldn’t wait to check it out. It was beautiful! 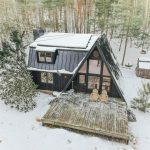 It’s the coolest base lodge I have ever seen. It’s brand new, so it’s hip, modern and the food is top notch. If you’re up for some tricks, you can try the Carinthia Parks jumps. If you’re not: it’s super cool to watch! This base lodge is a must see when you visit Mount Snow. 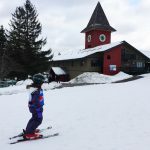 Ready to Ski Mount Snow? Click here for some of the current deals available. There are great packages if you pay for your lift tickets and rentals ahead of time. Also, check out Shamrockfest where you can get lift tickets from $17 on 3/15/2019. 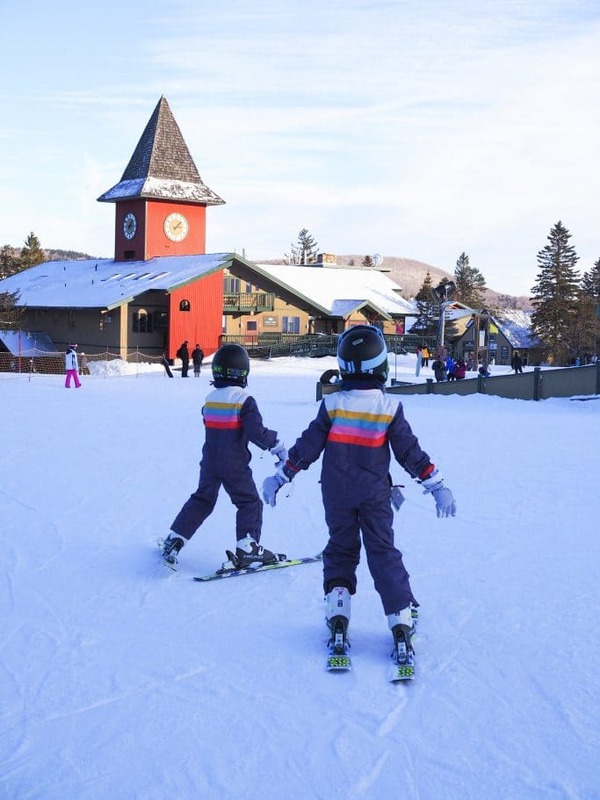 Each year Mount Snow has a kids weekend where everyone 17 & under ski for $17. It already happened this season but I am keeping an eye out for the 2020 dates! Disclosure: We were not compensated for this post. 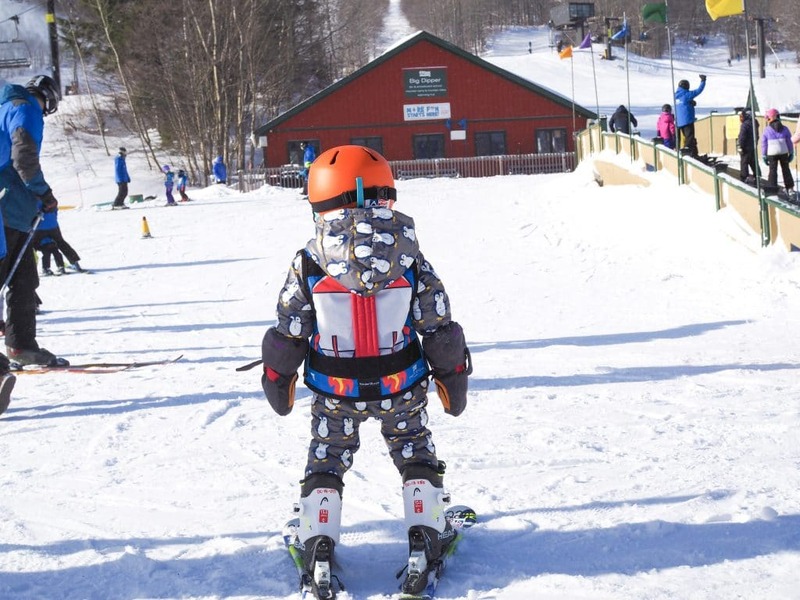 We were invited to visit Mount Snow again for the purpose of review. As always, all opinions are our own.